For our break to Mull, we stayed at the spacious Craignure Bay House. It’s a large new house built around enormous windows overlooking Craignure Bay and within walking distance of the ferry, the island’s only swimming pool and a great pub. It’s also fairly central on the island meaning all the main destinations are in range. Don’t be deceived by the map though, long single track roads and determined locals can somewhat inflate estimated journey times but don’t get stressed as you’re on holiday – savour the unspoiled west coast scenery. This lovely, bright, new-built 4 bedroom house has glorious, breath-taking views. It’s ideal for two families to share (we had 6 adults, 2 kids & dog). There are two ground floor bedrooms, a large open living room and dining room with wide screen TV and plenty of board games. On Mull, all the cafes we stopped at were child friendly. But we didn’t dine out as our kitchen was so well equipped and it was easier to sort out all the ages (toddlers, pregnant mums and grandparents) by dining in. We even battled the midges one day to barbeque overlooking the fantastic view. In Oban, while waiting for the ferry we enjoyed a great family meal at the Oban Piazza (Oban Piazza, North Pier. 01631 563 628). The vibrant atmosphere is immediately relaxing because you know even the loudest outburst by an excited four year old isn’t going to make your curl up in embarrassment. Especially when there’s plenty to get excited about. Most tables overlook the harbour with its constant coming and going of boats and ferries. (We were entertained no end by a dog in a speeding rubber dinghy that never got bored of trying to bite every single splash). If you don’t have time for a full meal then do try and stop at the Oban Chocolate Company Cafe (01631 566099). The award winning chocolate makers have a cafe down on the esplanade (just along from the Pier Piazza) with a glass window so you can watch the mouth-watering chocolates being made by hand. Their rich hot chocolates are to die for especially if it’s cold and wet outside. The Isle of Mull Hotel is a 10 minute walk away and has a good pool (and a kids pool) for non-residents in walking distance and there’s a legendary pub, the Craignure Inn 100 metres the other way. Duart Castle is just a few minutes drive from Craignure and is well worth a couple of hours (though our 4yr old was scared of the dungeons!). Also the narrow gauge railway which is short but young children will like it. Mull’s white sand beaches are famous. Craignure is centrally placed on Mull, so halfway between the must-sees of Iona Abbey and ‘all the coloured houses’ of Tobermory (where Balamory was filmed). We’d been warned by relatives who had been up the previous year that Tobermory isn’t exactly what the Balamory fans are hoping for and it’s true in a way as too many of the locations have reverted to normal house colours. So hundreds of people were meandering up and down the front all wondering why the cafes were closed on a drizzly bank holiday Sunday. Though it’s as picturesque town you could ever hope for and I’m sure it’ll all be open and sunny when you arrive in the summer. But just in case, if you want to guarantee yourself a nice cup of tea & some home baked cake, please stop at the cafe/gallery called Mull Pottery (next to Island Blue) at the top of the hill before you go down into the town. We didn’t get to Calgary Beach but we hear that’s lovely too. 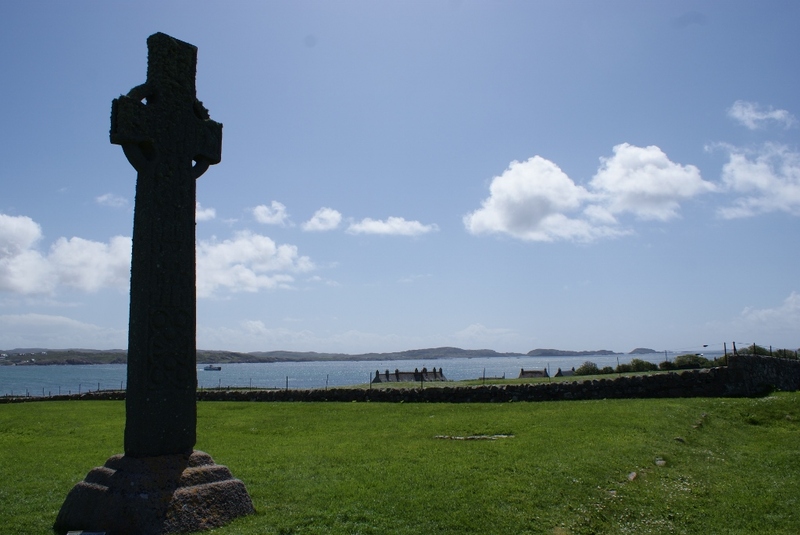 Overall then, we’d definitely recommend Mull & Iona for a few days with the children one summer.